Summer is in full swing and as you can tell from the sweltering heat, we’re in the thick of it. While many people associate getting sick with the winter, there are some common summer illnesses you should be aware of. Nothing can stop a day of fun in the sun faster than one of these illnesses or afflictions. However, when you know what to watch out for, you can steer clear of these day derailers. If you want to make sure you’re in fighting shape for the summer of a lifetime, come to Chicagoland Complete Healthcare for a checkup. While we may be big fans of the nice, warm weather that comes with summer, so too do little bugs that like to make meals out of us. Mosquitoes, ticks, and spiders are all in abundance when it gets hot out, so it’s important that you protect yourself from bug bites. A bite from a mosquito can transmit viruses like West Nile and yellow fever. Ticks are notorious for carrying Lyme disease and Rocky Mountain spotted fever. Depending on the type of spider, a bite might be uncomfortable at best and dangerous at worst. If you’re going to be out and about, it’s a good idea to have some bug spray on you, just in case. Few things are as refreshing as a dip in a cold pool on a hot day. However, water used for recreational purposes can become a breeding ground for bacteria. Whether it’s in a swimming pool, hot tub, or even a lake, we’re at risk of diseases that are spread through water, such as Giardia (not to be confused with delicious giardiniera), Crypto, Norovirus, and E. Coli. Swimming can also lead to water getting trapped within our ear canal where bacteria can grow, resulting in a painful ear infection known as swimmer’s ear. 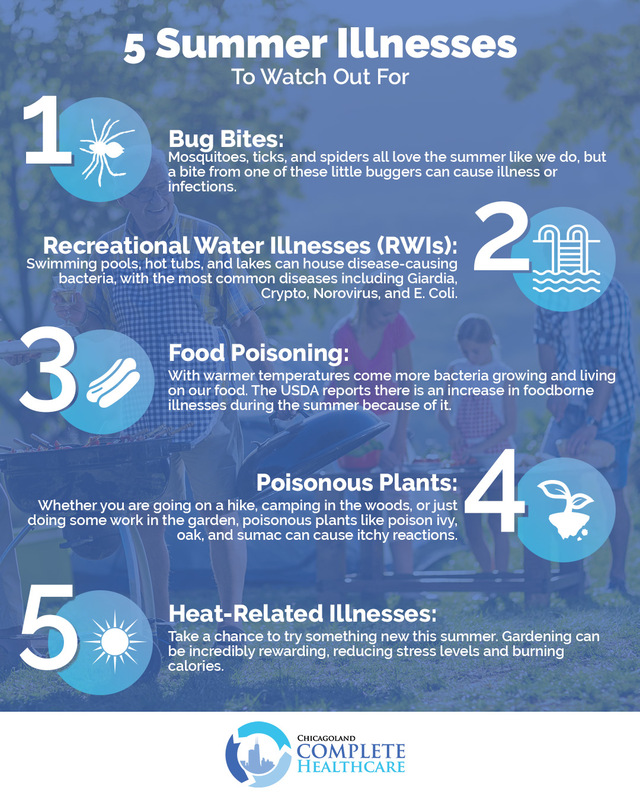 While we’re not saying you can’t go swimming this summer, it’s important that you exercise caution and avoid drinking any of the possibly infected water. You should also be sure to shower off after your swim to get rid of any lingering bacteria that might be hanging around. Bacteria thrives in warm temperatures, which means summer provides the perfect climate they need to grow and live on the food we eat. According to the USDA, foodborne illnesses increase in the summer. This is caused by the warmer weather and the amount of outdoor cooking that is done during the summer. Cooking outside takes away safety measures found in kitchens, such as proper food storage in a refrigerator and sinks to wash our hands. Practice safe cooking to avoid food poisoning! Summer gives us a chance to get outside and enjoy the great outdoors. Whether it’s going on a hike, camping in the woods, or just working in the garden, it’s wonderful to reconnect with nature. With that said, being outdoors also increases your risk of coming into contact with poisonous plants like poison ivy, oak, or sumac. While these plants can affect everyone, they’re especially bad for people with allergies, resulting in an uncomfortable and itchy rash. Learn how to identify these plants and wear long sleeves and pants when you’re going on your outdoor adventure to avoid an itchy surprise. While the warmth of the sun might feel good while you’re in the pool, too much heat can cause many issues. If you don’t take the proper precautions, you’re at risk of heat stroke and dehydration. When the human body is exposed to extremely hot temperatures for too long, it loses the ability to regulate its temperature. Be sure you are drinking enough water and you take some time in the shade to stay cool. After long, cold winters and rainy springs, it’s easy to get excited about a nice, hot summer. However, just because it’s warm out doesn’t mean you can’t get sick. Be sure you protect yourself from these summer dangers to keep your fun going on uninterrupted. If you would like more tips on how to stay healthy this summer, check out this recent blog we wrote discussing that. If you want to make sure you’re healthy and happy this summer, come to Chicagoland Complete Healthcare for a checkup. We’ll help you get the most out of these warmer months. We hope to see you soon!